The City of London Corporation, with the Friends of City Gardens, has launched the City of London’s first pop-up garden as part of its Low Emission Neighbourhood project. The City of London Corporation is developing the LEN around the Barbican, Guildhall and Bart’s hospital area following a successful funding application submitted in April 2016. The City of London LEN is one of five that will be set up across eight boroughs that will come into full effect by the start of 2019. Proposals for the scheme include air pollution awareness events, working with businesses to tackle emissions from deliveries and freight, new electric vehicle charging infrastructure and the introduction of green taxi ranks. Designed by landscape designers Studio Xmpl, the garden forms part of the City in Bloom Air Quality Challenge ‘Clean and green in seventeen’ which is linked to the Royal Horticultural Society’s Greening Grey Britain campaign. The garden will remain in place for at least two years as part of the LEN project. The launch also coincides with the UK’s first National Clean Air Day, which aims to raise awareness about the harmful effects of air pollution and how to reduce exposure to it. “The completion of this pop-up garden is a sign of things to come with the development of the LEN. 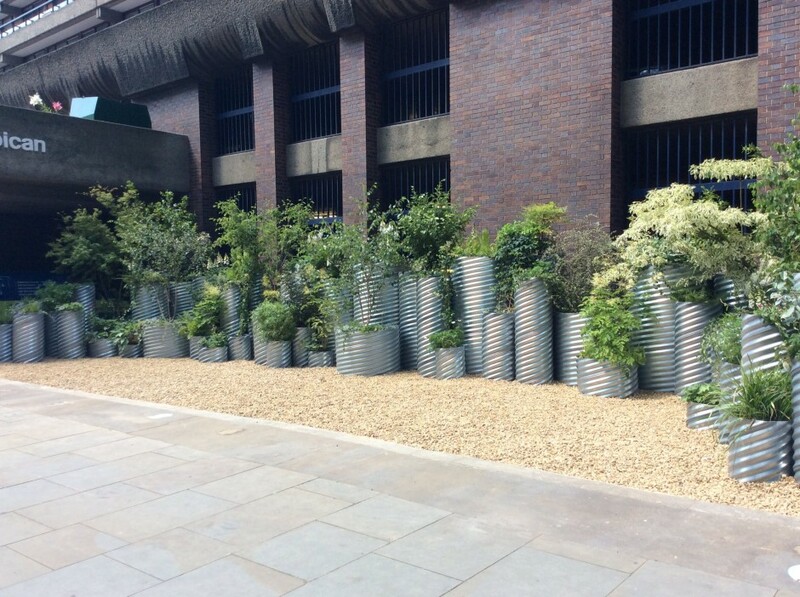 “Working in partnership with the Friends of City Gardens has once again demonstrated the demand by the local community for solutions to tackle the air quality in the Barbican and Golden lane areas. The City of London Corporation has been engaging with business on air quality for several years through its City Air Programme. It has banned the purchase of diesel vehicles for its own fleet of 300 vehicles – and it is pioneering a London-wide crackdown on drivers who leave their engines idling. Its City Air app gives Londoners low pollution travel routes across London and advice and alerts when air pollution is high. “We are very conscious about air quality in this area and I’m glad that this is one of the methods we are using to improve the environment. “Over 500 volunteer hours have been contributed by residents and City workers to create this garden. A lot of thought has gone into using plants that are effective in areas of high pollution. The City Corporation has agreed a deal with Addison Lee – London’s biggest private hire taxi firm – to automatically switch hybrid taxis to ‘electric mode’ in key areas of the City. The City Corporation has also introduced a City-wide 20mph zone, and its new procurement rules have brought in tight restrictions on harmful emissions from bulldozers and generators. The City Corporation protects and conserves 18 major green spaces in London and south east England – including two ancient woodlands – and over 200 smaller ones in the Square Mile. They include important wildlife habitats, sites of scientific interest and national nature reserves. They are protected from being built on by special legislation.